Is your dairy-free family obsessed with yogurt like mine? 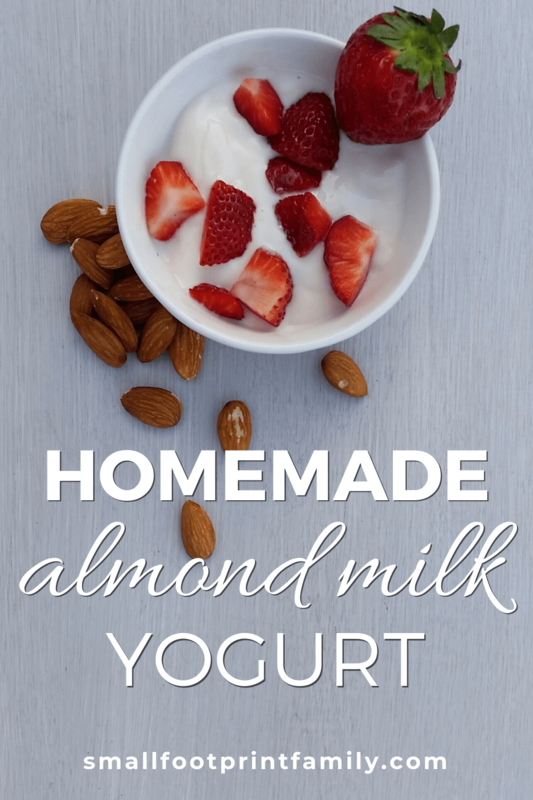 This homemade almond milk yogurt recipe is a delicious, affordable option if you and your family love yogurt but are vegan or can’t tolerate dairy products. Years ago, I made a gallon of homemade cow’s yogurt at a shot. My kids would gobble it up in a few days. It was simple to make and the control over each ingredient made me happy. Fast forward a few years. We discovered milk caused tummy aches, diarrhea, and heartburn in my kids. It was heartbreaking. My kids loved milk and yogurt! But the cost of non-dairy yogurt was a hard pill to swallow. The way my kids eat yogurt, they kick a pint size yogurt container each by 10am. I experimented with making my own almond milk yogurt. It was a rough road: Lots of failed yogurt batches and disappointed little kids when a batch didn’t pan out. We made the best of it. Here are 3 lessons I had to learn the hard way. Don’t make the same mistakes. Let’s save you time, money and frustration. I have attempted to make yogurt with several varieties of store-bought almond milk. I used the same process I used to make regular cow’s milk yogurt – FAIL! Each and EVERY time. Then I realized the process was different for almond milk yogurt. So, I tried a bunch of “no-fail” almond milk recipes. Still a fail! The problem? I did not follow those recipes exactly. I used store-bought almond milk instead of making my own. Anything but homemade almond milk will not work! I’ve tried many brands several times. No exceptions. Making your own almond milk does take a little more time, but it’s easier than you think it is. Almond milk yogurt, like most non-dairy yogurts, needs a thickener, otherwise it will be very runny. If you’ve made cow’s milk yogurt, you know it firms up, but not like a cup of store-bought, commercial yogurt, which is full of thickeners. Almond milk yogurt will be even more runny. This is great for use in smoothies, but not yogurt. I know it’s frustrating when you’re trying to avoid additives right!? We’re going to look at some healthy thickeners options to solve the problem. I read about people reusing the almond milk yogurt culture. I’d love to smell their yogurt to see if it has that distinct yogurt smell. I imagine it is just thickened milk. Yogurt should be tangy. Make sure you use a new culture each time for almond milk yogurt. Yogurt starter culture produces the most consistent yogurt results. I’ve heard success stories using a high quality probiotic capsule. I prefer the starter culture. I know it contains cultures specifically found in yogurt. The preference is yours. I found the FDA regulation below during my research. I had to share, it made me laugh. And shake my head. Since you don’t want sharp edges in your yogurt either, let’s talk thickeners. Get your yogurt to the perfect texture. Thickeners can be tricky. I’ve done a lot of experimentation with almond milk yogurt thickeners. More than I’d care to admit. Some thickeners were okay, others were a flop. Texture and thickness were the biggest issues. You want something smooth, not grainy. I’m sure you have a preference on your yogurt thickness too. Your preference might not jive with others in your home. I like a thicker yogurt, my 6-year-old loves when it is a runny mess. He’s always rooting for me to mess something up. I make our yogurt fairly thick and whisk his a little to get the consistency he likes. Here are the 2 thickeners I use in my yogurt. Homemade almond milk has the tendency to separate. Arrowroot flour is great to thicken the yogurt and keep the yogurt from separating. So disappointing when you end up with a watery mess on the bottom and a custard like yogurt on top. You’ve got to keep the milk evenly dispersed. Cornstarch can be used as a substitute. This is my favorite way to thicken my yogurt. I use 100% grass-fed gelatin from animals raised sustainably on pasture. I’m sneaking a healthy food in for my kids to eat without them knowing. It works great and has a consistent texture. If you’re vegan, you can swap it out for agar agar in equal amounts. Make sure you’re using powdered agar agar instead of the flakes. Interested in more information about thickeners? Check out Cultures for Health’s thickeners resource. Homemade almond milk will separate. I use sunflower lecithin to keep the milk from separating if I’m making almond milk. You do not need to add lecithin if you are making your almond milk into yogurt. Add 1 teaspoon of sunflower lecithin per 4 cups of almond milk. I add the sunflower lecithin once I strain the milk. A quick blend in the mixer does the trick. I struggled with breastfeeding my 4th child. Sunflower lecithin capsules saved my breastfeeding experience. It magically unclogs your milk ducts, which saved me from lots of struggle and pain. I hope it does for you, too. This homemade almond milk yogurt recipe is a delicious, affordable option if you and your family love yogurt but are vegan or can't tolerate dairy products. Pour 1 cup of raw almonds into a liquid measuring cup and cover with filtered water. Fill measuring cup with water to the 2 cups line. In the morning rinse and drain your almonds. Pour your soaked, rinsed and drained almonds into a blender and add 4 cups of purified water. I use a Vitamix. Blend for a few minutes until they are well pulverized. If your blender has less power, make sure to pulverize the almonds for a few minutes. Pour the milk mixture into a nut milk bag to strain out almond pulp. Reuse the almond pulp by baking it in the oven at 200 for 3-4 hours until it’s hard. Then grind it up and add the powder to baked goods or homemade granola. There’s no waste and it adds some extra protein. Sterilize the equipment you’ll be making your yogurt in, including spoons and the container you will incubate the yogurt in. You can get mold if your equipment is not sterilized. Save yourself from a failed yogurt batch. Pour boiling water over your equipment before using it. I boil water in my tea kettle to make pouring easy. Or you can run your equipment through the dishwasher. Add enough water to your almond milk to equal 4 cups. Mix 2 tablespoons of arrowroot powder into the bowl of 1 cup of milk. Whisk with a fork until incorporated. Heat the milk until it begins to bubble, simmer and thicken. This will sterilize your milk and prevent bad bacteria from cultivating. Pour the arrowroot mixture into the saucepan. Continue to whisk over heat for 5 minutes. Stay with it: It can boil over very quickly. Remove from the heat and watch your temperature as it decreases. You’ll need a candy thermometer for this. Once your milk has reached 110 degrees F, you are safe to add your culture. Anywhere between 100 and 110 degrees is the sweet spot. Incubate your yogurt at 110 degrees for 6–24 hours, depending on how tart you like it. The longer you incubate it, the more tart it will become. I incubate for 8 hours. A quick search will give you more incubation ideas. Find the best method for you. After incubation, refrigerate your yogurt overnight. It will take some time to set. Add flavoring by stirring in a bit of fruit or jam until combined. What’s your favorite way to enjoy your homemade yogurt? I’d love to hear from you in the comments below. Shannon from Natural Soap Mom has a passion to help others understand what’s really safe to put on their families skin—soaps, cleaners and more. Shannon loves to DIY: Check out her DIY cleaners and beauty recipes she uses personally in her home. This recipe is amazing!! My daughter can’t eat dairy so when I finally gave her this yogurt she loved it! Making it again for sure! It’s perfect! Can this almond milk be frozen? And if it can, for how long? Can it be frozen when agar agar and aru powder are added or before? So I can just pop it out of the freezer when I need to add yogurt starter. The rate my daughter is eating it i would have to make almond milk every day ? Do I need to pop the almond shells out once soaked? You should only soak unshelled almonds. Looks much the same as other recipes. Other similar ones have failed me. Sometimes I have to add an additional packet of vegan culture and re-incubate another 12 hours. HOWEVER, I’ll give this one a shot. I use an Anova precision sous vide immersion circulator set to 111°F, and a mason jar. If you use a 12 quart tub, it’s perfect for multiple batches at once. I place the filled jars in the cooker, just snug the band and lid, then fill the tub with warm tap water to the bottom-most thread or top of the shoulder of the jar. The temperature can be precisely set and will hold it to within +/- 1/2°F. I thicken mine with maltodextrin (or Ultratex III – concentrated 3x maltodextrin – from Modernist Pantry et al). It’s made from highly refined tapioca starch, leaves no texture or taste and dissolves 100% in water unlike other thickeners) and its cheap! I also add a tsp of sugar to feed the bugs. What I plan on doing is doubling the almonds while using the same amount of water for a more concentrated milk base. I am curious if one can add the almond pulp to Te yogurt for additional texture and protein and when would be the best time to do this? Hi! Do u know if using almond milk made using its skin might failed the yogurt? I had a lot of fun using your recipe, and got out a nice sour product that I would not exactly call yogurt. I had to use agar, as I’m vegetarian. The yogurt came out too stiff; it wouldn’t run even if you mixed it a ton. It also was not nearly creamy enough; it just tasted like sour water. I’m going to try again without diluting the almond milk as much when I blend it, and I will either skip the agar or use significantly less. I hope this will help! I made this following your instructions and using cornstarch instead of arrowroot and agar agar instead of gelatin. It turned out WAY too thick! I then read online that agar agar should be substituted about 1/8 that of gelatin because it is so strong! I’d revise that portion of the recipe for figure knowledge. I loved your explanation of the why, why not and how many times you have tried. It has happened the same to me. I thought I was going to give up for ever trying to make almond-milk yogurt. To add an information, I have just found cultures to make non-dairy yogurt in a shop for vegetarians/vegan people (these are different bacteria than those for dairy). I tried with this kind of culture and it was really good, except for the thickening part. I got some really good areas but when stirring the yogurt, they become more liquid. 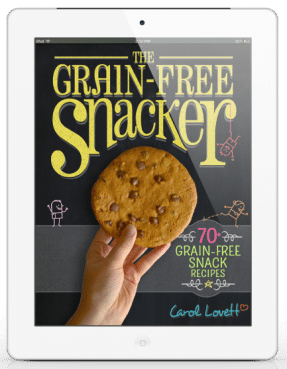 So my question for you is: Can I skip the arrowroot ingredient? is it enough with the gelatin? Arrowroot has too many carbs for the Keto diet. I tried with the Xanthan gum (dissolved in 1/2 spoon of Coconut oil to avoid granules or lumps) and it was OK but not perfect. What do you think? Thank you! Choose the gelatin option for keto-friendly. Thanks for the thoughtful comment. Sounds like you’ve been working on homemade yogurt for a while too! I think the gelatin would be enough if you are ok with a thinner yogurt. I would try it and see the results. Worst case scenario, you add it to smoothies. You could also try adding extra gelatin. I wouldn’t double it, but play with the amount a little. I’ve made yogurt in my yogurt maker in the past but always using dairy milk. I’ve since found out that my body can tolerate so much , so i’ve been using my own homemade nut milks for some months now ns exactly, apart from having to guess the temperature when cooling as I don’t have a thermometer. I’ve just looked after leaving it for 14 am so disappointed, it’s the same consistency as it was when I poured it in! I’ve left it in the fridge overnight and its still as runny………. Any thoughts?? I’ve made yogurt in my yogurt maker in the past but always using dairy milk. I’ve since found out that my body can tolerate so much , so i’ve been using my own homemade nut milks for some months now ns exactly, apart from having to guess the temperature when cooling as I don’t have a thermometer. I’ve just looked after leaving it for 14 am so disappointed, it’s the same consistency as it was when I poured it in! Any thoughts?? Nut milk yogurts don’t thicken much without the addition of gelatin or agar agar. They will then thicken up in the fridge after fermenting. Hello I would like to add some honey to Sweeten it a Little. At what time do I add it? Stir the honey in either when you add the probiotic, or after the yogurt is done, before you eat it. p.s. my message omitted that i followed your recipe part from.. I also refrigerated it over night and no change. How frustrating that your yogurt did not turn out!!! I feel your pain. All that work…. Refrigeration usually sets mine up. But it shouldn’t be runny like that. I wonder if you fully activated the gelatin? It has to heat up, dissolve and start to thicken as you heat it. As hard as it is to hear, I’d try again. Pay special attention to dissolving the gelatin and letting the milk slightly thicken as you’re doing that. I enjoyed the tips and recipe that you gave for the homemade almond milk yogurt. I can appreciate all the work you much have put into getting this right. I had not heard that anyone had managed to make it and I can totally understand that 1) it needs to be made with a yogurt culture and homemade almond milk and 2) some thickening agents (gelatin was my first idea). I use 4 cups of almond milk, not to add an extra 4 cups. I’m thinking something was measured incorrectly. But it’s so hard to tell. I would just whisk the milk up to make it more fluid. Please try again! I know it’s frustrating but once you get it – amazing! Thanks for taking the time to comment. Hi I’ve made this twice. Once with homemade milk and once with store bought milk. Both times the yogurt was a thick blob after fermenting for 6 hours. Any suggestions? Try stirring or mixing the yogurt for a smoother texture. I prefer a thicker yogurt, so this recipe reflects that. More like store bought yogurt. I’d suggest reducing the thickeners to your liking. 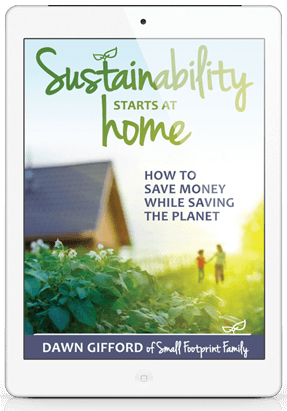 And Dawn is spot on – whisk to thin it out a little. Can you add liquid Stevia before you incubate? Stevia will not feed the probiotic bacteria, so make sure you have some sugar in there to get the ferment going. If you need it sweeter, add the stevia after fermentation, while mixing. I agree with Dawn, make sure there is sugar in the yogurt. The bacteria needs to feed on it. Thanks for commenting Kay! Hello- I’m making this today and it says in comments to add sugar. When and how much? In the recipe it doesn’t mention adding sugar 🙁 look forward to hearing from you! Hi, I’m confused. There is no sugar in the recipe. When should it be added? I’ve make your recipe quite often and I love it!!! Can you provide the nutritional facts if possible? I’m following the keto diet and this information would be very helpful. Thank you!!! I suggest running the recipe through your favorite online nutrition calculator. That way you can set it to see the nutrients most important to you. Christina I’m so glad you enjoy it as much as we do! Dawn pointed you in the right direction on the nutritional facts – go you for doing the deto diet!! This yogurt is absolutely wonderful! It was kind of a thrash to make the almond milk and then the yogurt but it is so tasty it’s definitely worth the extra effort. My only substitution was using 1 teaspoon of Super Agar in place of the 1 tablespoon of agar agar. I will certainly be making this again. Thank you for sharing your method. So glad it worked out for you so well! I’m so glad to hear it turned out well for you 🙂 Great question! I would keep it for a week or so. It’s fermented, so that should help. I usually don’t have this problem, my kids eat it too fast. Can you use sliced almonds to soak? I think sliced almonds should work, just make sure to use the same amount of almonds. I think whole almonds would be more cost effective, but I understand it’s what we have on hand. Hope you enjoy the recipe! I have tried the recipe, I followed the recipe strictly using gelatin grass fed, etc. But it separated while it was cooling after 8 hours incubation. Separation is normal for non-dairy yogurt. Just stir it to remix and refrigerate to firm it up. Make sure you are using the sunflower lecithin, it will help with the separation. Just mix to recombine, it’s all good. I just found you and this recipe and cant wait to try it! Thanks so much for talking all the work out of it for us. I too, have dairy problems and was living on yogurt, that I made by the gallon! I miss it so much. I do have a quick question…when ready to incubate, do you cover your containers first or leave them open? I made the yogurt and let it ferment overnight hoping to get a nice tart result. Instead I got solid yogurt with a rather bland taste. Any suggestions? 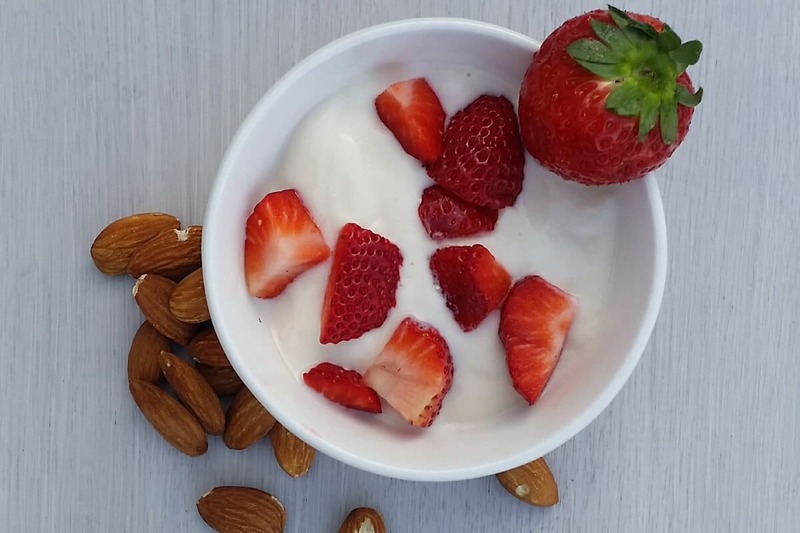 Almond yogurt is not super tart, but you might try a different probiotic culture next time. Dawn is right, almond milk yogurt will not be tart like regular yogurt. Sorry to hear you were disappointed. If you prefer a bitter taste, some yogurt cultures might produce a more tart result. I can’t say I’ve experimented much with different cultures and their taste though. Good luck! Not all recipes translate when you double the ingredients, particularly if you are using finicky ingredients like gelatin, agar agar or coconut flour, which need to be carefully adjusted when you make a larger batch. But if your yogurt comes out too runny, even after refrigerating, you can always drip it through a cheesecloth, or add more thickener. When I made my first batch of this recipe it was a bit too thin for my liking. On my next one I added an extra teaspoon of gelatin and it was perfect for me. I have not tried doubling it, just tweeking what’s already there to my taste. So excited to try this recipe as all my other recipe attempts have failed. Also love that the recipe doesn’t include any refined sugar. I would love to add a touch of maple syrup to it though. Would you suggest I add it when heating the milk? I would stir it in after heating the milk, as it cools down. 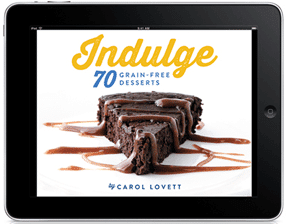 Great recipe, I need to know how much agar agar to use please. I am not Shannon, but the recipe says to use 1 Tbsp (it says to use 1 tbsp of gelatin or agar agar – since it does not specify another amount of the agar agar, it usually means to use the same). Also, from my experience using agar agar, it makes sense that 1 tbsp should do the job! Should the yogurt for some reason be a bit too watery, you can always strain it until it is thick enough. I do that with my yogurt (so far I have made soy and soy/coconut milk, the latter is just to die for, when I open my pressure cooker, my house smells strongly like vanilla, even if there isn’t any additives in the yogurt or milk. After straining, it is like the most super creamy greek yogurt). I can’t wait to try making a batch with my homemade almond milk. I don’t soak the almonds though, I blend around 1 lb at a time into a rough almond meal, then make milk from that, a bit at a time (I usually use 3 heaping/packed tbsp of almond meal and appr 0.7 liter water, as I have 0.7ltr blender bottles, which I like to use for milk. You can soak it for 10-30 min, but with a high speed blender, it is really not necessary. I strain it through a very fine (200 mesh) laboratory sieve since I hate using nutmilk bags (I just stir with a spatula, then push down on it, to let the milk through)… Makes milk making a breeze! ? ?